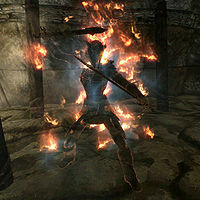 The Fire Spirit will be encountered in Labyrinthian during the quest The Staff of Magnus. It is found inside a chamber with a flaming sealed door. Approaching the door will spawn the spirit. The Fire Spirit wears an unobtainable set of ancient Nord armor and wields two leveled ancient Nord swords, which may be up to honed in quality. It also knows the Firebolt and Wall of Flames spells. The Fire Spirit also has a special passive ability that gives it its flaming appearance, as well as providing a 33 percent resistance to fire at the cost of a 33 percent weakness to frost. This page was last modified on 15 February 2014, at 10:22.